Today we talk about the Large Catechism, 10th Commandment and Conclusion of Commandments beginning at paragraph 303. Host Charles Henrickson and guests Alan Wollenburg and James Gier discuss the Eighth Commandment, paragraphs 271-291, in the Large Catechism. Hosted by Rev. Matt Clark with guest Rev. Dr. Paul Biber of St. Lucas Lutheran Church in St. Louis MO. Host Charles Henrickson and guests Tyler Hauptmeier, Adam Koontz, and Jim Roemke discuss the Fifth Commandment, paragraphs 189-198, in the Large Catechism. Today we look at the Large Catechism, Fourth Commandment. Host Charles Henrickson and guests Sean Smith and Chris Hull discuss the Fourth Commandment, paragraphs 108-113, in the Large Catechism. Host Charles Henrickson and guests Tom Egger and Steve Riordan discuss the Third Commandment, paragraphs 85-99, in the Large Catechism. Host Charles Henrickson and guests Duane Meissner and Sean Smith discuss the Second Commandment, paragraphs 57-70, in the Large Catechism. Today we discuss the Second Commandment in the Large Catechism up to line 56. Today we talk about the Large Catechism and the explanation of the Appendix to the First Commandment. With guests Rev. Warren Woerth and Rev. David Juhl. Host Rev. Charlie Henrickson and guests Rev. Alan Wollenburg and Rev. Daniel Hinton discuss the Short Preface of the Large Catechism. 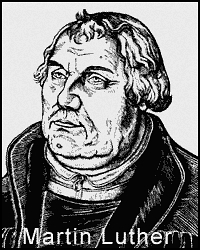 Today, we review the longer Preface to The Large Catechism and look at the reasons why Luther wrote this marvelous work and it is still needed today.